1	Place the cod, prawns, 100g edamame beans, lime zest and 2 tbsp miso sauce in a food processor and blend to give a coarse paste. Mould into 8 fishcakes, about 7cm in diameter. Chill while making the salad. 2	Cook the noodles according to pack instructions. Mix the sesame oil, lime juice and rice vinegar. Halve the cucumber, scrape out the seeds with a teaspoon and thinly slice. Toss into the dressing with the noodles, carrots and cress. 3	Pour boiling water over the remaining edamame beans in a small bowl and set aside. Heat a little oil in a large frying pan and fry the fishcakes in 2 batches for 2 minutes each side or until golden and cooked throughout, remove and keep warm. 4	Add the remaining miso sauce, 50ml water and the drained edamame to the pan and cook for 1-2 minutes to heat through. 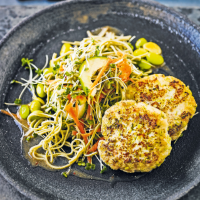 Serve the fish cakes drizzled with miso sauce and with the noodle salad alongside.